PayPal ( www.paypal.co.uk ) are the biggest online payment acceptance company in the world. Owned by Ebay they provide fully automated and secure online payment facilities for no initial outlay (subject to sign up criteria). Running a PayPal web site needs no end user software and customers can buy online at your site making secure payments straight away by credit and debit card. Sound good so far. 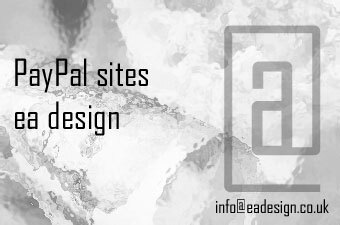 EA Design can build a PayPal site for you, along with precoded prices for all your products and online payment facilities through PayPal for just £425 including web space and domain name. What is the downside to PayPal? There really is only one downside to the PayPal system. The buyer needs to have a PayPal account themselves in order to make a purchase from you. Now, if you have never heard of PayPal you have likely never been on Ebay but, take our word for it, many people have and more people than you think regularly shop with their PayPal account online (they are, after all the biggest in the world!). Still, it should be recognised that you market, with a PayPal account rather than a full e-commerce site, will be smaller and it is really a cost decision that you will have to make, deciding which system is right for you. As usual, EA Design are happy to chat you through all the options with you and help you decide on the best way forward for your business. Why not contact us today for an informal discussion.